A Christmas Carol is a Film programme that first aired in 1999 and has been classified a U certificate. This adaptation of Dickens' timeless classic brings a story of hope, compassion and the uplifting power of the spirit. 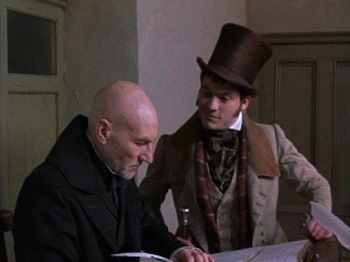 It's the year 1850 and its Christmas Eve, the melancholy Scrooge (Patrick Stewart) finds himself alone at home when he sees before him the ghost of late business partner, Jacob Marley (Bernard Lloyd), who died seven years earlier. Marley warns the miserable Scrooge that he will repent, even in death, for all the suffering he has caused others and he has only one chance to escape his ultimate fate. 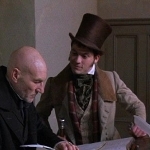 He is told that three spirits will visit him, one belonging to Christmas Past (Joel Grey), Christmas Present (Desmond Barrit) and the ghost of Christmas yet to come (Tim Potter) and he is to obey them in order to redeem himself and make amends to his loyal and long-suffering clerk, Bob Cratchit (Richard E. Grant).